Google today said the Unicode Technical Committee, the organization that oversees the development of emoji, has agreed to add some of the professional women emoji Google proposed earlier this year. Specifically, Unicode will add 11 (of the 13 suggested) professional female emoji in all skin colors. 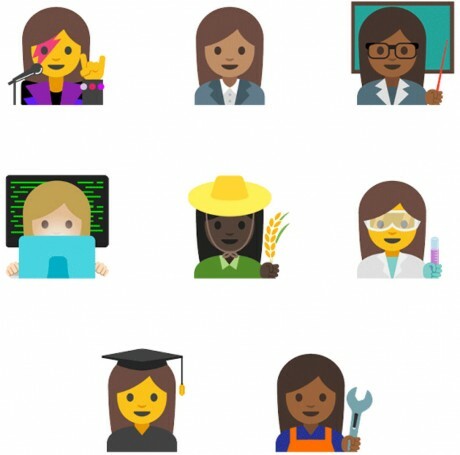 Google says together these will amount to more then 100 new emoji depicting women in a wider variety of roles at work. Unicode also agreed to add male and female versions to 33 existing emoji. Google says the new emoji will be included in future versions of Android and other platforms, such as iOS. In June, Unicode accepted 72 new emoji in the Unicode 9.0 standard. It's unclear how quickly Unicode will adopt these new emoji from Google. Facebook today said it has taken steps to ensure all users of its Messenger application enjoy a rich experience. Moving forward, emoji will appear exactly the same across platforms, including the web, Android, iOS, and Windows. The emoji that will appear in Unicode 11.0 have been finalized, according to the Unicode Consortium, and new options will be available for hair, skin, and gender. Some 157 new characters are included in Unicode 11.0. Microsoft today added more women to Skype's supported set of mojis and emoticons. The new moji specifically depict women in a greater variety of professional roles, such as scientist, athlete, teacher, and director. New emoji are coming to a phone near you, eventually. Unicode 11.0, which was finalized in February, will be released on June 5, according to Emojipedia.